BYRAM, Miss. 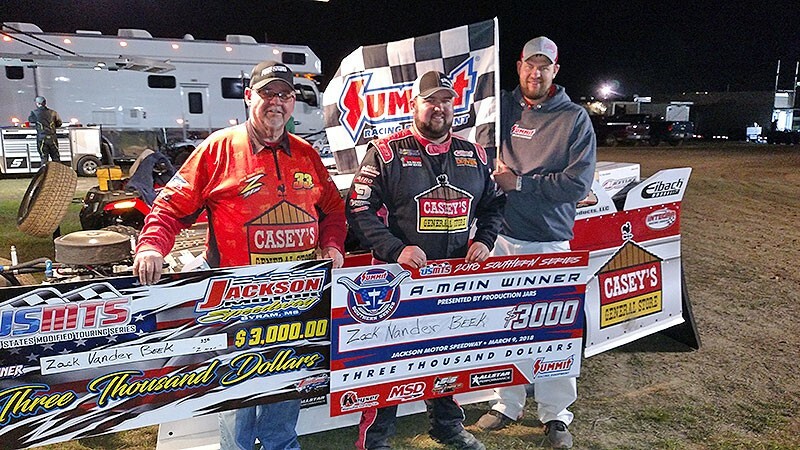 (March 9)–The meanest modifieds on the planet converged on the Jackson Motor Speedway Friday for round 4 of the 9th Annual Summit USMTS Winter Speedweeks presented by MSD Performance and a dual event with the Summit USMTS Southern Series and USMTS Hunt for the Casey’s Cup national tour. Sybesma Graphics Pole Award winner Stormy Scott of Las Cruces, N.M., grabbed the lead at the the start but Tennessee’s Lucas Lee used the high line around the 3/8-mile dirt oval to steal the top spot away on the fourth lap with 2016 USRA Modified national champion Lucas Schott, Arizona’s Jake O’Neil and four-time and defending USMTS national champion Jason Hughes following in their tire tracks. The first half of the race was riddled with yellow flags. The fourth flew for Hughes on lap 10 , and he did not return to finish the last 40 laps. Two-time USMTS national champ Rodney Sanders slowed on lap 16 to bring out the fifth caution and did not return either. Jason Krohn of Slayton, Minn., pulled to the infield on lap 20, leaving no former national champs in the field. The seventh caution waved on lap 22 for Scott who has yet to complete a main event. Meanwhile, Lee continued to pound the cushion with Schott, VanderBeek and chasing the leader around the high side until the eighth caution waved with eight laps remaining. Under yellow, 16th-starting and fourth-running Terry Phillips left the track with a flat tire and when the green flag returned VanderBeek powered in front of Schott to control second place. Lee and VanderBeek separated themselves from the pack and finally reached lapped traffic with 10 laps to go with Cade Dillard entering the picture when a stray bumper in turn one forced the race’s final caution with eight laps remaining. From there, VanderBeek shadowed Lee around the race track but Lee was able to hold back the challenges and appeared destined for his career-first USMTS win, but after taking the checkered flag first he was disqualified during post-race technical inspections for an engine setback violation. Lee’s lost glory gave the victory to VanderBeek, along with the $3,000 winner’s share of the prize money. It was VanderBeek’s 43rd career USMTS triumph, jumping him one spot ahead of Tommy Myer to sixth on the all-time wins list and one behind Stormy Scott’s 44 wins. Schott finished with a runner-up effort and Dillard climbed from 13th to third in the contest. Johnny Scott was fourth and Jake O’Neil rounded out the top five. Sixth through tenth, respectively, were Jake Timm, Paul Niznik, Dereck Ramirez, Ethan Dotson and Logan Robertson. Dillard captured last year’s inaugural visit to the Whynot Motorsports Park in Meridian, Miss., where the series will return on Saturday, March 10, as the touring titans of the USMTS bring the boom to the “House of Hook” in Meridian with six racing divisions on tap. NeSmith Crate Late Models, NeSmith Late Model Sportsmans, NeSmith Street Stocks, Factory Stocks and Hot Shots round out the program with pit gates opening at 1 p.m., grandstands open at 3, hot lap at 6 and racing at 6:30. Adults are $20 to get in the grandstands, kids age 6-12 are $10. Pit passes are $35 for adults, $15 for kids ages 6-12. Children 5 and under get in for free on both sides of the fence. The Whynot Motorsports Park is a semi-banked 3/10-mile dirt oval located at the intersection of JW Reynolds Rd. and Old Hwy. 19 Southeast (4773 JW Reynolds Rd., Meridian, MS 39301). For questions please call Phillip Hathcock at (205) 965-3070 or Rodney Wing at (601) 527-0084. The track’s website can be found at www.whynotmotorsportspark.com. You can also like them on Facebook at www.facebook.com/whynotmotorsportspark, follow on Twitter at www.twitter.com/Whynotracing1 and see them on Instagram at www.instagram.com/whynot_motorsports_park. The action reaches a boiling point on Sunday, March 11, as the meanest machines in America make their maiden voyage to the legendary Magnolia Motor Speedway in Columbus for a wheel-to-wheel showdown at “The Mag” with four classes in action including 604 Crate Late Models, 602 Crate Late Models and Factory Stocks. The pit gate opens at 1 p.m. and spectator gates open at 3. Hot laps start at 4:45 and the green flag waves at 5:15. Grandstand tickets are $20 for adults, $15 for seniors and military, $10 for juniors ages 11-16 and kids ages 10 and under are free. The Magnolia Motor Speedway is a 3/8-mile dirt oval located near the intersection of US 82 and US 45 (take the Macon/Meridian exit off US 82). The track’s website is www.magnoliadirt.com. For fans unable to attend the action in person this weekend, all three shows-including every lap of every division-will be broadcast live on www.RacinDirt.com. Jackson Motor Speedway, Byram, Miss. 1. (5) 2S Stormy Scott, Las Cruces, N.M.
2. (2) 4R Dereck Ramirez, Woodward, Okla.
3. (4) 23 Logan Robertson, Shamrock, Texas. 4. (7) 7K Jason Krohn, Slayton, Minn.
5. (6) 75 Terry Phillips, Springfield, Mo. 6. (8) 9 Ken Schrader, Concord, N.C.
7. (9) 20 Rodney Sanders, Worthington, Minn.
8. (3) 8 Bradley Rose, Magee, Miss. 9. (1) 12T Race Taylor, Utica, Miss. 1. (2) 33Z Zack VanderBeek, New Sharon, Iowa. 2. (1) 97 Cade Dillard, Robeline, La. 3. (7) 71 Philip Houston, Odessa, Texas. 4. (5) 65 Carlos Ahumada Jr. (R), Canutillo, Texas. 5. (4) 20R Bryan Rowland, Woodward, Okla.
6. (9) 20T Bailey Rowland, Woodward, Okla.
7. (6) 4V Billy Vogel, West Fargo, N.D.
8. (3) 112 Mike Jarrell, Ellsville, Miss. 9. (8) 71 Jessie Hoskins (R), Longdale, Okla.
1. (4) 0 Jake O’Neil (R), Tucson, Ariz.
2. (3) 42 Paul Niznik, Medford, Wis.
3. (6) 49JR Jake Timm, Winona, Minn.
4. (1) 21 Austin Bonner, Elk City, Okla.
5. (5) 11 Spencer Hughes, Meridian, Miss. 6. (2) 3 Toby Hodge, Pulaski, Miss. 7. (8) 24Z Zane Ferrell (R), Hermitage, Ark. 8. (7) 83 Blake Carrier, Amite, La. 2. (7) 1st Johnny Scott, Cameron, Mo. 3. (5) 174 Ethan Dotson (R), Bakersfield, Calif.
4. (3) 34 Ben Stephens, Sumrall, Miss. 5. (1) 37R Kyle Rutkoski, Eight Mile, Ala.
6. (8) CBR25 Justin McRee, Cottondale, Ala.
7. (4) 9 Bryan Powell, Magee, Miss. 8. (6) 5A Timothy Culp, Prattsville, Ark. 1. (1) 12 Lucas Lee, Paris, Tenn.
3. (4) 1M Curt Myers, Cameron, Wis.
4. (8) 23 Adam Kates, Tonganoxie, Kan.
5. (6) 211 Chase Hatton, DeBerry, Texas. 6. (2) 8C Chris Clark, Jackson, Wyo. 7. 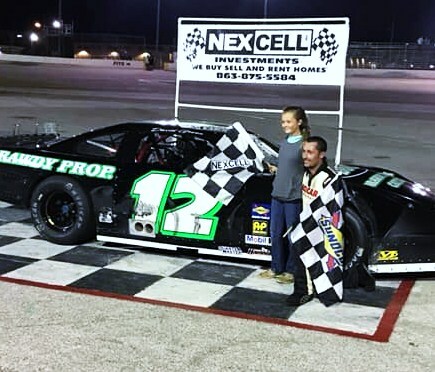 (5) 12 Jason Ingalls, Longview, Texas. 8. (7) 51 R.J. Otto, Statesville, N.C.
1. (4) 12 Jason Hughes, Watts, Okla.
2. (2) 10W Hunter Wilbanks, Lakeland, Tenn.
3. (3) 14R Riley Brown, Hattiesburg, Miss. 4. (8) 4B Cory Bruggeman (R), Stillwater, Minn.
5. (6) 4 Bo Day (R), Greenville, Texas. 6. (1) 19 Brooks Strength, Raymond, Miss. 7. (5) 7 Bryan Foy (R), Lacombe, La. 8. (7) 23C Charles Sibley, Livingston, La. 2. (5) 75 Terry Phillips, Springfield, Mo. 3. (9) 20 Rodney Sanders, Worthington, Minn.
4. (4) 65 Carlos Ahumada Jr. (R), Canutillo, Texas. 5. (8) 3 Toby Hodge, Pulaski, Miss. 6. (10) 8 Bradley Rose, Magee, Miss., Shaw/Wall2Wall, $75. 7. (11) 5A Timothy Culp, Prattsville, Ark., GRT/Sput’s, $75. 8. (12) 12T Race Taylor, Utica, Miss., Shaw/Barker, $75. 9. (3) 1M Curt Myers, Cameron, Wis., Hughes/Sput’s, $90. 10. (7) 37R Kyle Rutkoski, Eight Mile, Ala., Shaw/EMS, $75. 11. (2) 23 Adam Kates, Tonganoxie, Kan., VanderBuilt/Speedway, $90. 12. (6) 20T Bailey Rowland, Woodward, Okla., BlackWidow/ProPower, $75. DNS – 9 Bryan Powell, Magee, Miss., Hughes/Mullins, $75. 1. (3) 7K Jason Krohn, Slayton, Minn.
2. (2) 4B Cory Bruggeman (R), Stillwater, Minn.
3. (6) 20R Bryan Rowland, Woodward, Okla.
4. (1) 10W Hunter Wilbanks, Lakeland, Tenn.
5. (4) 21 Austin Bonner, Elk City, Okla.
6. (5) 211 Chase Hatton, DeBerry, Texas., IRP/F1, $75. 7. (7) 8C Chris Clark, Jackson, Wyo., GRT/Clark, $90. 8. (9) 112 Mike Jarrell, Ellsville, Miss., Harris/Jarrell, $75. 9. (10) 51 R.J. Otto, Statesville, N.C., Lethal/Jackson, $75. 10. (8) 24Z Zane Ferrell (R), Hermitage, Ark. DNS – 9 Ken Schrader, Concord, N.C., Lethal/Mullins, $90. DNS – 12 Jason Ingalls, Longview, Texas, IRP/PTS, $90. DNS – 71 Jessie Hoskins (R), Longdale, Okla., Longhorn/Mullins, $90. 1. (1) 174 Ethan Dotson (R), Bakersfield, Calif.
2. (3) 14R Riley Brown, Hattiesburg, Miss. 3. (8) 4V Billy Vogel, West Fargo, N.D.
4. (2) 23 Logan Robertson, Shamrock, Texas. 5. (4) 34 Ben Stephens, Sumrall, Miss., Elite/Mullins, $75. 6. (5) 4 Bo Day (R), Greenville, Texas. 7. (6) 11 Spencer Hughes, Meridian, Miss., GRT/Brown, $75. 8. (11) 23C Charles Sibley, Livingston, La., GRT/Wall2Wall, $75. 9. (10) 83 Blake Carrier, Amite, La., Pierce/Carrier, $75. 10. (9) 7 Bryan Foy (R), Lacombe, La., Lethal/Mullins, $90. 11. (7) 19 Brooks Strength, Raymond, Miss., Hughes/Mullins, $75. DNS – CBR25 Justin McRee, Cottondale, Ala., Hughes/MRE, $75. 1. (5) 33z Zack VanderBeek, New Sharon, Iowa, VanderBuilt/Sput’s, 40, $3000. 2. (6) 69 Lucas Schott, Chatfield, Minn., MBCustoms/Hill, 40, $1600. 3. (13) 97 Cade Dillard, Robeline, La., MBCustoms/Knowles, 40, $1300. 4. (8) 1st Johnny Scott, Cameron, Mo., VanderBuilt/Durham, 40, $1100. 5. (4) 0 Jake O’Neil (R), Tucson, Ariz., LG2/Cornett, 40, $700. 6. (11) 49jr Jake Timm, Winona, Minn., MBCustoms/Sput’s, 40, $600. 7. (9) 42 Paul Niznik, Medford, Wis., Rocket/Niznik, 40, $500. 8. (12) 4r Dereck Ramirez, Woodward, Okla., Hughes/Cornett, 40, $450. 9. (15) 174 Ethan Dotson (R), Bakersfield, Calif., MBCustoms/ChevPerf, 40, $625. 10. (24) 23 Logan Robertson, Shamrock, Texas, MBCustoms/Knowles, 40, $600. 11. (20) 20r Bryan Rowland, Woodward, Okla., BlackWidow/ProPower, 40, $575. 12. (21) 4v Billy Vogel, West Fargo, N.D., MBCustoms/Sput’s, 40, $350. 13. (18) 14R Riley Brown, Hattiesburg, Miss., /, 40, $250. 14. (10) 91 Joe Duvall, Claremore, Okla., MBCustoms/ChevPerf, 40, $500. 15. (26) 21 Austin Bonner, Elk City, Okla., MBCustoms/Karl, 40, $275. 16. (17) 4B Cory Bruggeman (R), Stillwater, Minn., MBCustoms/Tim’s, 40, $275. 17. (16) 75 Terry Phillips, Springfield, Mo., GRT/Durham, 40, $275. 18. (25) 24z Zane Ferrell (R), Hermitage, Ark., MBCustoms/ASI, 39, $475. 19. (22) 65 Carlos Ahumada Jr. (R), Canutillo, Texas, GRT/BMS, 37, $275. 20. (28) 3 Toby Hodge, Pulaski, Miss., GRT/Brown, 28, $225. 21. (1) 2s Stormy Scott, Las Cruces, N.M., VanderBuilt/Mullins, 21, $275. 22. (14) 7K Jason Krohn, Slayton, Minn., MBCustoms/Sput’s, 18, $275. 23. (23) 10W Hunter Wilbanks, Lakeland, Tenn., Brucebilt/Mullins, 16, $225. 24. (27) 4 Bo Day (R), Greenville, Texas, MBCustoms/Mullins, 16, $275. 25. (19) 20 Rodney Sanders, Worthington, Minn., MBCustoms/Hatfield, 16, $475. 26. (7) 71 Philip Houston, Odessa, Texas, MBCustoms/KPE, 15, $275. 27. (3) 12 Jason Hughes, Watts, Okla., Hughes/Mullins, 12, $275. DQ – (2) 12 Lucas Lee, Paris, Tenn., Brucebilt/KMF, 40, $225. Lap Leaders: S. Scott 1-3, Lee 4-40. Total Laps Led: Lee 37, S. Scott 3. Margin of Victory: 1.101 seconds. Time of Race: 36 minutes, 40.548 seconds (9 cautions). Provisional Starters: Ferrell, Bonner, Day, Hodge (track). Eibach Spring Forward Award: Vogel (advanced 14 positions). FK Rod Ends Hard Charger: Robertson (started 24th, finished 10th). Next Race: Saturday, March 10, Whynot Motorsports Park, Meridian, Miss. USMTS Hunt for the Casey’s Cup Points: . Summit USMTS Southern Series Points: . Grant Junghans USMTS Rookie of the Year Points: . USMTS Engine Builder of the Year Points: . USMTS Manufacturers Championship Points: . Beyea Custom Headers – Phillips. BSB Manufacturing – S. Scott. E3 Spark Plugs – Dillard. FK Rod Ends – Robertson. Forty9 Designs – Duvall, Ahumada. GRT Race Cars – Clark. Integra Shocks & Springs – Ferrell. Jerovetz Motorsports Racing Parts – Bonner. KSE Racing Products – Dotson. Maxima Racing Oils – VanderBeek. Mesilla Valley Transportation – Clark. Out-Pace Racing Products – Bruggeman. Simpson Performance Products – S. Scott. Swift Springs – VanderBeek, Brown. Sybesma Graphics – S. Scott. VP Racing Fuels – VanderBeek. Wehrs Machine & Racing Products – VanderBeek. Wilwood Disc Brakes – Niznik.